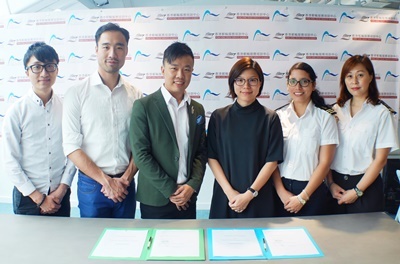 In view of the growing demand for skilled workers in the cruise and hospitality sectors, the Hong Kong Cruise Academy (HKCA), a member of Hong Kong Cruise & Yacht Industry Association (HKCYIA), and Hong Kong Cruise Services Academy (HKCSA) will jointly organize a Diploma in Cruise Service and Hospitality Management. The programme will cultivate young talents for the industry by providing professional training in tourism, hospitality and cruise services. Kara Yeung, Executive Director of HKCA, and Sunny Ng, School Manager and CEO of HKCSA, have signed a co-operation agreement to officially launch the programme in September. The programme is designed to equip students with the knowledge and skills needed for a successful career in the cruise services industry. The 1-year programme covers cruise and hospitality knowledge, cruise operations, overview of tourism industry, customer services, foreign languages, Standards of Training, Certification and Watchkeeping for Seafarers (STCW) Certificate, as well as other vocational skills and management knowledge. The entry requirement for the programme is five HKDSE subjects at Level 2; or five passes in HKCEE; or other equivalent qualifications. The programme will be held at Kai Tak Cruise Terminal, with a shuttle bus service which will operate between Kowloon Tong and the cruise terminal. The programme is the first diploma programme in Hong Kong that includes the STCW Certificate. Graduates of this programme who have completed an internship and passed the examination can get a STCW Certificate, the minimum legal requirement for working in the hotel department on international cruise lines. Combining theoretical learning with hands-on practical training, the programme provides students with internship opportunities in ground services in cruise terminal and commercial yacht management services. Internship opportunities in international cruise lines, such as Costa Cruises, MSC Cruises and Carnival Cruise Line, will also be arranged to allow students to apply their knowledge to real world situations. The programme also offers a comprehensive job referral network, helping graduates start their careers in cruise services. Enrolment for the programme is now open. For details, please visit www.hkcsa.edu.hk or call 2728 0638.